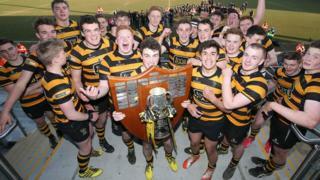 RBAI win the Schools' Cup for a second straight year thanks to 13-3 victory over Campbell College in the final at a sun-kissed Kingspan Stadium. James Hume was the hero for Inst, scoring all their points including a last-gasp try. RBAI captain Conor Field, Hume and coach Dan Super gave their thoughts on the Belfast school's success.